Raw Papaya Smoothie: Super C! Morning smoothies, including this raw papaya smoothie, are such a great way to pack your nutritional morning punch, to start your day off right. It’s also a great way to get more fruits and greens into your diet. This morning I made a smoothie with fruit from the land here on the big Island of Hawaii. I try to make use of what’s growing around me, what’s in season and of course use only organic foods. This raw papaya smoothie is packed with vitamin C, a super healthy immune boosting vitamin from the papaya, oranges, and camu camu powder. This smoothie just gave me such a great boost, I had to share it! All you need is a blender for this delicious raw food papaya smoothie. For this raw smoothie recipe, all you will need is a high-powered blender. 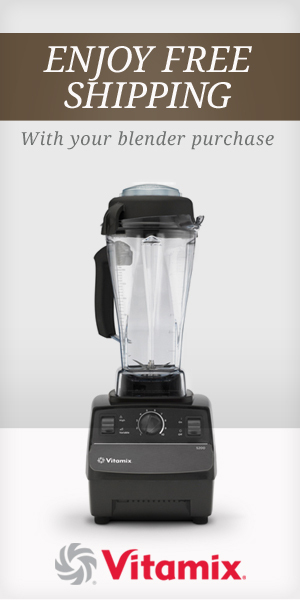 I recommend the Vitamix. It’s one of the top 4 raw food kitchen essentials that I recommend you stock your kitchen with. That’s all you need for this one! Papaya contains the digestive enzyme, papain, that literally digests itself without a whole lot of extra work required from our bodies. Enjoy this high powered raw food smoothie!